Barça reached the semi finals of the Copa del Rey tonight but the game meant the end of our 28 game unbeaten run as Betis deservedly beat us 3-1 on the night. The result is not particularly worrying but it does show that a team can overrun us if we are not completely alert at the beginning of a game and this should serve as a warning for games such as the one in four weeks at Arsenal in the Champions League. There were various changes to our line up as was expected though Guardiola showed his respect for Betis by including Messi and Xavi in the starting eleven. However, we have often seen when there are more than one or two changes in the team we begin to notice the difference and tonight we were caught very cold in the first ten minutes which led to the real possibility of a miraculous comeback for Betis. You have got to take your hat off to Betis. In the first game at Camp Nou they came out to give us an open game of football and had their chances to embarrass us, however, they took a beating in the end because they tired in the last half hour. Tonight they obviously decided they had nothing to lose and the best thing was to go all out from the beginning and try and catch us cold. And that is exactly what happened, in the first minute Milito was a little slow which led to him giving away a free kick on the side of the penalty area. When Salva fired in the free kick our back line was not straight, Bojan who was closest to the kicker ended up playing Molina onside and it was relatively easy for the Betis striker to divert the ball past Pinto. Should our centre backs have left Molina goalside while they could see where Bojan was better than Bojan could see them? Whoever was to blame it was a mess and Guardiola will no doubt have us practicing how to defend free kicks from the side of the penalty box. We didn’t wake up after this knock and Betis continued to be more alert all over the pitch. In the seventh minute Ezequiel broke away from Mascherano and Keita in midfield, he then found a pass between Piqué and Milito for Molina to run on to and stab under Pinto. It was quite incredible, 2-0 down after seven minutes and the miracle was beginning to look quite possible, our players were looking worried and they were obviously struggling psychologically for a few minutes. It wasn’t until Afellay made a good 50 yard run up the right in the 13th minute that we had something to appreciate, and this was soon followed by our first “minute-of-possession” as we began to calm down but Betis hit us again with a direct fast attack and Molina again got away from our central defenders and Pinto had to come out to save. It was of course Afellay’s first start for the team and he showed some positive signs, around the 20th minute he twice brought saves from Casto with stinging shots from outside the area. Could this be the shooting option that some people have called for? Afellay also made an uncharacteristic-for-Barça type run by trying to go outside the full back and cross from the goal line like a normal right winger instead of playing the ball inside to the waiting Messi. It came to nothing but it was an interesting aspect and it is clear that Guardiola is always concerned in inventing new ideas for our attack and I’m sure Afellay will surprise us with more details in the coming weeks hopefully with a bit more luck. 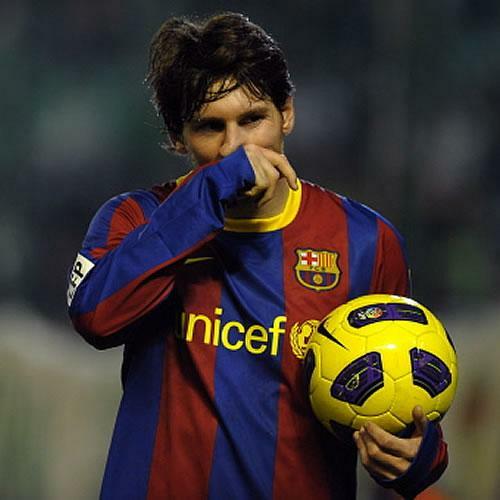 Xavi and Messi had been quite quiet but Xavi began to be seen a bit more as Betis’s initial all-out rush began to drop. The first couple of attempts to connect between the two came to nothing but on 37 minutes Xavi sent a harmless looking ball towards Messi who was around 45 yards from goal with two defenders close by. Messi reached the ball first and then showed just how devastating his acceleration can be by bursting away to the edge of the area from where he shot through Casto’s legs. The goal certainly made the rest of the night somewhat easier as Betis now needed to win 7-1 on the night, but now it became more a question of whether Betis could win on the night and Betis, backed by the magnificent crowd at the Benito Villamarin stadium, showed they were up for the crack by making it 3-1 on the stroke of half time. A free kick was swung in, Milito jumped but could only head the ball up in a loop in the area, Pinto had misjudged his run out of his goal and was out of position when Arzo hooked the falling ball back towards the goal and into the net. The second half lacked the same intensity which was demonstrated by Messi’s awful penalty on 53 minutes. The ref had blown for a defender’s hand getting on Messi’s shot, but when Messi stepped up for the penalty he slipped a bit on his back foot which meant he sent his shot clear of the crossbar. Betis almost got a fourth in the 66th minute after an excellent run from Pereira down the right, his cross came across to Nacho who fired against pinto’s right post from 15 yards out. It was a reminder of what might have happened if Messi hadn’t got the away goal. It was the last time Betis came close to another goal though their fans did have the fun of shouting olés as Betis strung together a dozen passes as our players chased their heels, and I should also take my hat off to the Betis fans for the ovation they gave Xavi when he was subbed off near the end. It is always a shame to lose but I am happy that if we had to lose it was to a team like Betis who impressed me with their spirit for the game in both legs, I will be delighted to see them back in the Primera Division next season. The two early goals were certainly a shock but it certainly made the game more interesting than I had thought it was going to be. I also feel I should praise Guardiola because despite the final result nobody can accuse him of not taking the game seriously. I was calling for the inclusion of more youngsters in the team as I did not think we could possibly get knocked out, however, having seen the game I am sure we could have suffered more without Messi’s goal and the youngsters might have taken a knock to their confidence if they had played in this game (I don’t know how much our youngsters took from the beating at Sevilla in the supercopa in August for example). Guardiola showed his experience by giving Betis the respect they deserve, as he knows that Betis in this stadium are capable of getting you against the ropes, and in the end we had enough experience not to lose our heads and get through the tie without too many worries. I’ve already mentioned a bit about Afellay who I’m sure will improve, the negative side was from Milito who looks off the pace, but at least he got some minutes tonight which he clearly needs at the moment, and I was also disappointed again with Bojan who continues to have these games with little impact, he was stuck out on the left most of the game and had little involvement all night. We will now play Almeria in the semi-final over the next two weeks. Barça: Pinto 5.5; Adriano 5.5, Piqué 5.5, Milito 5, Maxwell 5.5; Xavi 6 (Busquets m77, 6), Mascherano 5.5, Keita 5.5; Afellay 6 (Abidal m78, 6.5), Messi 5.5, Bojan 5 (Jeffren m86, –). Goals: m1 Molina 1-0, m7 Molina 2-0, m38 Messi 2-1, m45+2 Arzo 3-1. This entry was posted in Copa Del Rey, Leo Messi, Match reports and tagged Afellay, Barça, Barcelona, betis, Copa, Football, Messi. Bookmark the permalink. It is sad that the streak had to end, but I guess that all good things come to an end. The only sad thing about last night’s match was putting an end to our unbeaten streak but it wasn’t an entirely poor performance and Betis actually deserved to win. However, the only positive I’ll like to take from the match was Afellay’s outstandin’ display. He made quite some decent moves and brilliant runs despite not havin’ the luxury of startin’ the game with most of the regulars. I see a great deal of potential in him and I’ll rather score him a 7 as opposed to Nic’s 6.5 (Pique also deserves a 7 because he did just well holdin’ his ground and if not for him, I fear we would have conceded more) because he was spectacular last night. About Milito, all he needs is more playin’ time for it’s only logical that he couldn’t have played any better after spendin’ so much time on the bench. So that’s why people don’t have too much trust in Pinto… Okay, now I get it. Fantastic, truely fantastic game from Betis, in a way they “outbarceloned” us, their pressing was better than ours (almost unimaginable), their technique was better than ours, they just really deserved to win, hats off to them. I’m glad they didn’t take the 5-0 as an excuse and realised they had chances in the first game and that with a bit more of luck this offensive way could work against us, it made for another exciting game, on their part at least. Okay, any team playing with eight “non-first-team-players” is gonna suffer. This we could see when we gave an effort on pressing, it was disjointed and not as efficient as it generally is. I said “when we gave an effort”, cos’ we really played on economy yesterday, something that was also illustrated by Xavi trying a few turns looking for someone to pass and just having to play it back cos’ he had no movement in front of him. Messi for example was particularly shy when it came to pressing, but thanks god for his goal, don’t know where we would have gone without it, and he truely made it out of nothing. Affelay showed some good things, and yes he can certainly bring us something different, it was nice to see him on the wing, brought back memories of Giuly, but I’m not sure our way of playing can accommodate a pure winger. Needs to be better than he was yesterday, but in a poor team performance, he was one of the better individuals I thought. Some other were pretty poor. Keita had one typical of him performance: he is a good support player, but you can’t ask him to make something happen if the team is struggling. Pinto I already mentioned, Adriano didn’t impress me much, but the two who really had nightmares of games were Milito and Bojan. Milito had a terrible terrible first half, very low on confidence, misplaced a lot of passes, even had once to ridiculously turn back to pass to Pinto so unsure of himself he was after a few misses, and, if not the only culprit, his responsibilty is engaged on all three goals. Terrible performance, can be excused for a lack of recent action, but will have to be far better than that. Finally, was an interesting trick from Guardiola in the last ten minutes to go for a 3-5-2, doubt it would have worked with these players, but it can be an interesting option! Hmm, not so happy with the loss. I was sooo annoyed by Adriano and Bojan. Afellay did great and I was suprised that he had been subd. More so that Pep didn’t called Adriano back. Milito was way off balance!! As for now, we’re going through and that’s important. Finally a reality check for brilliant Barca – thankfully this defeat didn’t cost us dearly and will banish any illusion of invincibility. Moreover this result will mean Barca don’t underestimate any opponent in the upcoming games. Mililto was below par but then he’s hardly going to get better on the bench although maybe we could have thrown in the young Bartra for Pique towards the end. Hats off to Betis, they showed such a great spirit that most of top flight teams deeply lack against us, they deserved to win and trust me guys if it wasn’t for Messi goal, I think we would’ve witnessed one of the greatest comebacks in the history the Copa, but thank God there’s a Messi. The only bright side from this game was the rising star full blooded Moroccan Ibrahim Afellay, I was really impressed by his composure and footwork, he definitely gives a whole different dimension to team and his long range shots is a huge plus. Basically, Barça played itself. Truly. Maybe not in the sense of individual skill, but definitely as a side that was looking for the ball and was very put out when they lost it. Quite impressed with Betis and looking forward to their return to La Liga. Pepe Mel is to be hugely complimented on that display.